We were pretty surprised that the dramatic hail storm we experienced last week didn’t result in any obvious damage. It took a few days, but Cyndie finally did notice some wounds to the chicken coop. On Tuesday, as we sat down to dinner during the early stages of that night’s flooding rain storm, Cyndie remembered to tell me about her find. She showed me a picture on her phone that was taken so close I couldn’t completely discern the angle of what I was seeing. 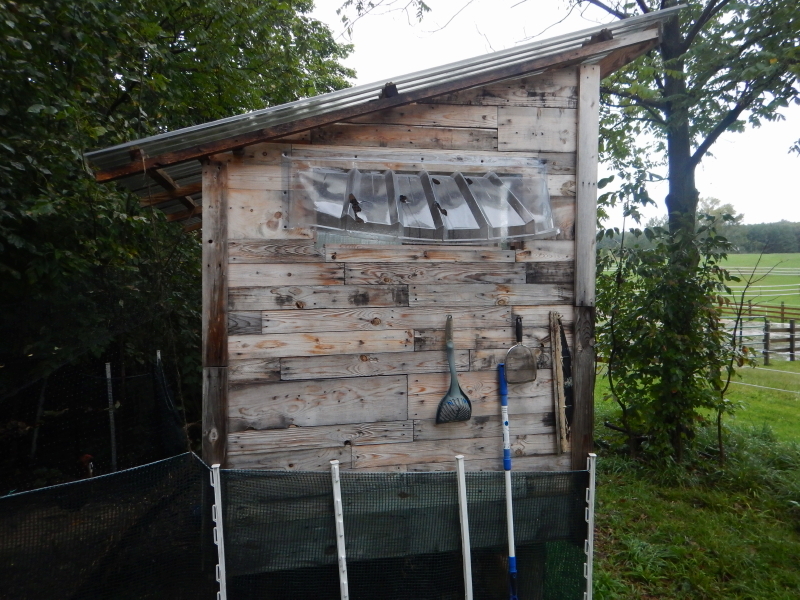 She said there were holes in the plastic on the coop and my mind jumped immediately to the roof panels. I freaked. How could she be so calm when there were holes in the roof and it was raining like crazy? She said she didn’t think it would be a problem. I couldn’t understand her reasoning and hopped up from dinner to run out in the rain and see for myself. I was thinking we had to, at the very least, try putting a tarp over the roof. It was the window cover. They are much thinner plastic than the roof panels. Actually, I’m impressed that the roof panels withstood the beating by such large hail stones. Since only that one window cover was damaged, we now have a pretty good idea of the angle from which the hail fell. Cyndie was right. Those holes weren’t a problem during the overnight deluge.